From Shanda Subia, Lampasas Public Library. Our program was on Monday, February 25 [for International Polar Bear Day]. We could see the polar bear, Cranberry (she was born around Thanksgiving), in the background, and then Shannon talked about what characteristics polar bears have that allow them to live in the Arctic climate, and she would ask questions along the way. Then, at the end, she allowed time for questions; we had several for her. Afterwards, a dad asked how we found out about this and mentioned maybe doing that with some other zoos/animals. I told him I had just received an email about this, and I didn’t know if other zoos did things like this or not, but I told him I’d look into it. It was very well-received; I think the adults enjoyed it as much as the kids. Technology is awesome – how else could central Texans see polar bears at the Alaska Zoo?! Visit https://www.alaskazoo.org/ to learn more. They have a polar bear webcam and an email list for future announcements. Here is a wonderful video from First Lady Michelle Obama encouraging kids and parents to continue learning throughout the summer. The National Summer Learning Association has declared that July 14th is Summer Learning Day to do just that. Use their resources, such as this video, to talk to your community about the importance of not falling behind and how your library resources and programs and keep kids on track. We know everyone will have a fantastic summer! Thank you for all you do to #keepkidslearning ! STEM Education Week is a week long recognition to raise awareness of the importance of STEM programs and career choices by proclamation of the Governor of Texas. You can participate by hosting a STEM event, registering your event, and using the resources available through the STEMTX website. If you plan on using STEM Education Week as an opportunity to highlight any programming at your library, make sure to register your event. Let our local and statewide elected officials know that public libraries are important informal STEM educational centers. Every April, the Academy of American Poets celebrates National Poetry Month to ensure that poetry gains national attention. They commission an artist to create a poster that can be requested for free or downloaded directly from their website. Above is an image of the 2016 poster. There are other resources available such as National Poem in Your Pocket Day, the Dear Poet project to help teachers and students engage with poetry, and tips for librarians on how to celebrate poetry. Use this as an excuse to highlight poetry books from your collection with a display, put on a poetry slam or other special program, or even just sharing a Poem-A-Day on your social media profiles. Their site has lots of resources such as a curriculum, suggested ways of celebrating, activities from specific authors, and printables like posters and shelftalkers. 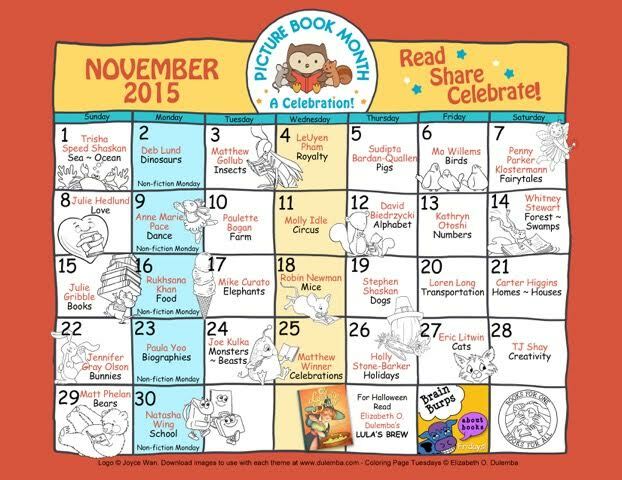 I love free resources and extra ways we can encourage families to read together! How could you use these resources at your library? United for Libraries will coordinate the 10th annual National Friends of Libraries Week Oct. 18-24, 2015. The celebration offers a two-fold opportunity to celebrate Friends. Use the time to creatively promote your group in the community, to raise awareness, and to promote membership. This is also an excellent opportunity for your library and Board of Trustees to recognize the Friends for their help and support of the library. In celebration of the ninth annual National Friends of Libraries Week, Oct.19-25, 2014, United for Libraries recorded a webinar with Libby Post of Communication Services and Doreen Hannon, executive director of the Salem-South Lyon (Mich.) District Library, who discussed the library’s successful millage campaign, developed thanks to a Neal-Schuman grant. Watch the free recording, which runs just over one hour. Doreen Hannon received a Bachelor of Science from Michigan State University and a MLIS degree from Wayne State University. She has worked at the Salem-South Lyon District Library (SSLDL) since 1996 and has served as Library Director since 2002. Libby Post, one of United for Libraries’ advocacy consultants, has been working with public libraries to pass funding and district initiatives as well as building referendums since 2005. She is the founder of the Library Campaign Training Institute and has a success rate of over 80%. She consulted with Salem-South Lyon Library District and helped the library lay out a successful strategy for their millage campaign utilizing the Citizens-Save-Libraries Power Guide for Successful Advocacy. The Young Adult Library Services Association (YALSA) encourages libraries to use the Get Away theme during Teen Read Week™, October 18 – 24, 2015, to spotlight all the great resources and activities available to help teens build literacy skills while reading for the fun of it. An annual celebration, this year’s theme encourages libraries to help teens escape from the day to day grind of school, homework, family responsibilities, part time jobs and so on by picking up something to read. Interpret the theme in ways that highlight a variety of resources in your collection—fantasy novels, sci-fi, beach reads, travel books, tales of adventure and escape, and more! The Teen Read Week website offers great resources from planning checklists to publicity to book and media lists. There is a Pinterest board for collecting activities on the Get Away theme. YALSA was able to provide $1,000 grants thanks to the Dollar General Literacy Fund to libraries who proposed innovative literacy-focused Teen Read Week activities. Check their site for when to apply for 2016 grants. In October 2015, Texas will join archival repositories across the nation to celebrate Archives Month and promote the preservation of our country’s documentary heritage. Archives Month in Texas aims to celebrate the value of Texas’ historical records, to publicize the many ways these records enrich our lives, to recognize those who maintain our communities’ historical records, and to increase public awareness of the importance of preserving historical treasures and making them available for use by present and future generations. TSLAC offers resources for Archives Month such as proclamations and ideas on how to celebrate in your community on their website. The 4th Annual Star Wars Reads Day takes place on October 10th. The official Star Wars website has resources for activities and publicity. Brightly also has some great printables and activities. This would be a great time to showcase your BB-8 Sphero robot! Does your library participate in anyway? Please share with us how you celebrate! Join educators and space enthusiasts around the world to celebrate World Space Week, Oct. 4-10, 2015. This international event commemorates the beginning of the Space Age with the launch of Sputnik 1 on Oct. 4, 1957. World Space Week is the largest public space event in the world, with celebrations in more than 60 nations. During World Space Week, teachers are encouraged to use space-themed activities. To learn more about World Space Week, search for events in your area, and find educational materials, visit http://www.worldspaceweek.org.